Are You Observant Enough to Have Noticed This Sweet New Morgantown Street Art? 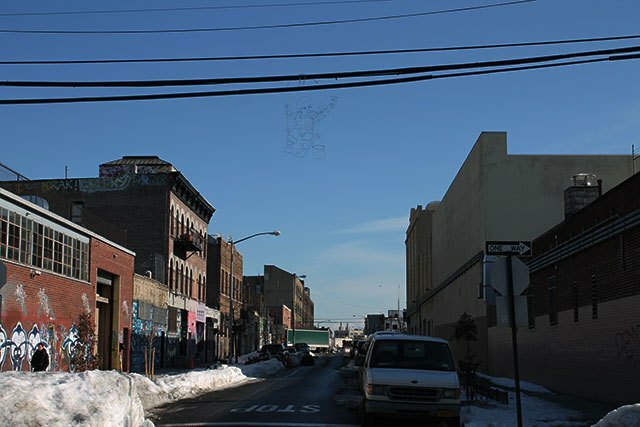 Reed Bmore's sign painter hangs on a telephone wire at Thames and Bogart (Photo by Emilie Ruscoe for Bushwick Daily). Morgantown's street art, and its commercial counterparts, can be an assault on the senses these days. Remember "Call Me if You Nasty"? Or that time the neighborhood was told to go west to the post industrial promised land, Detroit? So we don't blame you if, in between the giant promotional mural for A Very Murray Christmas and that very colorful Adobe ad by Beacon's, not to mention the 29 inches of snow we got last weekend, you missed the latest, sweetest street art added to the Bogart street corridor. 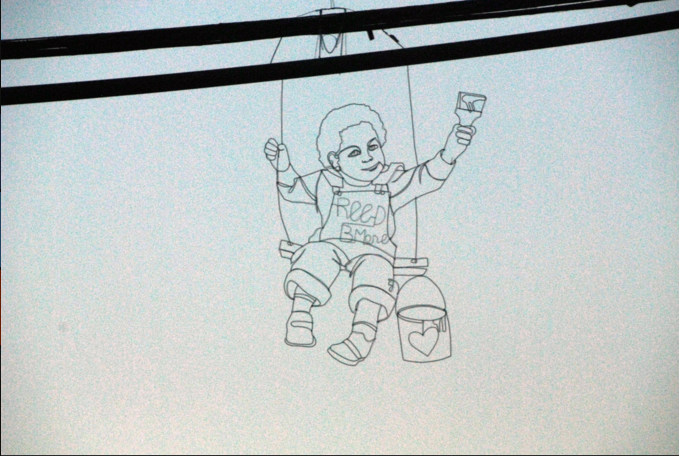 Baltimore-based street artist Reed Bmore installed a little sign painter, who hangs from a telephone wire. "Personally, I think conventional art you usually see in galleries, or what was meant to be inside, only reaches a certain audience and does not impact people the way I want it should sometimes. So that in mind plus my infinite boredom I chose to start puting up art publicly a year ago", Bmore tells Bushwick Daily. Bmore is beloved in charm city, where he's been the subject of media attention for activist art in the wake of the death of Freddie Gray. So tell us honestly—did you notice this piece before we pointed it out?